I made my first batch of sauce last weekend. The tomato plants have struggled along and I needed to do something with what I had but it was not enough. I went to a farm stand on Saturday and bought a box of “seconds” for $15 and started the 4-5 hour process of making sauce. A friend of mine wants me to teach her how to can tomatoes so I wrote down quantities and steps this time. Usually I just do it and don’t follow a recipe however it is hard to tell someone else how much of each ingredient to have on hand! The garlic, onions, basil, oregano, carrots, squash, eggplant, and about a third of the tomatoes are from my garden. The purchased tomatoes and peppers come from a farm close to Gettysburg, PA so I am saying this is slow sauce. This process takes awhile and it seems like I use a ton of pots, pans, utensils, etc so the end result is a messy kitchen. Thank goodness the cleaning crew came on Monday though I am still finding tomato splatters in the kitchen. The pot is 12 quarts and just eyeballing it at this point, I thought I had 8 quarts. I finished the process on Tuesday with a hot water canning bath. And ended up with 9 quarts, I processed 7 quarts as that is the max the canner holds. The rest will go into lasagna as requested by my son before he returns to school. Here is the recipe, documented mainly for my benefit, so maybe I can repeat it! I brought this to a boil and then simmered it a couple of hours to reduce. 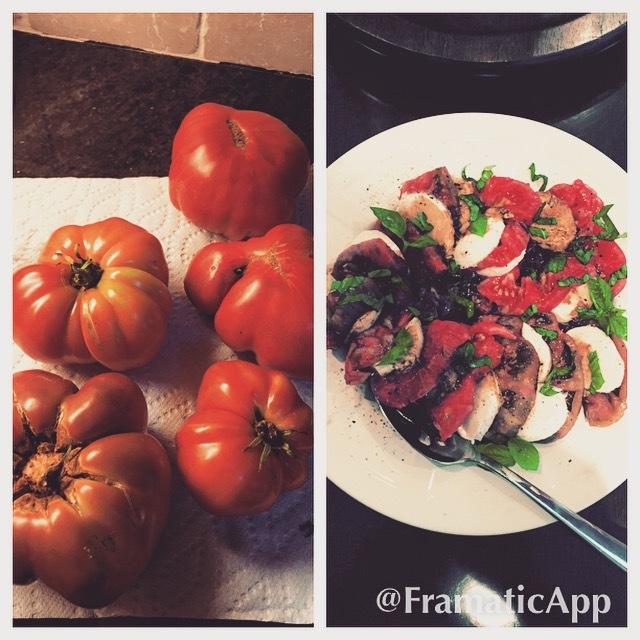 We finally have some tomatoes from my garden, it took awhile with rainy May and the chloratic tomato plants I had. Some I grew myself and some I ordered from a company that is totally devoted to tomatoes but I won’t mention their name (smile) as the plants came in dismal condition. So we had to get them healthy enough to be planted. Last night we had BLTs for dinner, the bacon came from Springfield Butcher. And each of us changed it up a bit as we built the sandwich. There was the BLT+cheese-cheddar on the first sandwich and pepper jack on the second sandwich. And the BT+basil, my personal favorite. The last one was BLT x2 with lettuce then tomato then bacon then tomato then lettuce layered between the bread. I did not take photos-photo fail-again. Also I made ratatouille with all the ingredients from my garden, eggplants, yellow squash, peppers, onions, garlic, basil, and tomatoes. Doesn’t get more local/slow food than that! So we had a bit of a mishap at the community garden. It appears someone or something hit the gate posts and broke them. As the community garden coordinator, I arranged to get it repaired. I found a great handyman not too long ago, he helped me with some repairs on a townhouse that I am looking after for a friend who is active duty and deployed to Europe. Anyway, the gate would hardly open as the posts wobbled back and forth. So Joe the handyman had a pretty large job to dig up the posts and concrete so he could replace them. The gate looks great and works so much better. The vegie garden is not looking so good, heat and disease are taking a toll. If we can persevere for a couple more weeks, then the plants should produce through the fall. The pollinators keep on doing their job. I see lots of butterflies and bees working away. Its August 1 and as usual I had some work tasks to get done, submit invoices, file and pay sales taxes, review the monthly budget, all part of the routine. I like to get these tasks out of the way and think about our plans for the month. I will help our son get ready to return to school but first he is going to OBX with some friends. And trying to keep the garden going through the heat of August. Hopefully starting to can produce from the garden. I have several home improvement projects planned. And will share more on that- if I can remember to take before photos! And for fun, we have one more beach trip planned. Anyway, I hope your month is shaping up nicely! 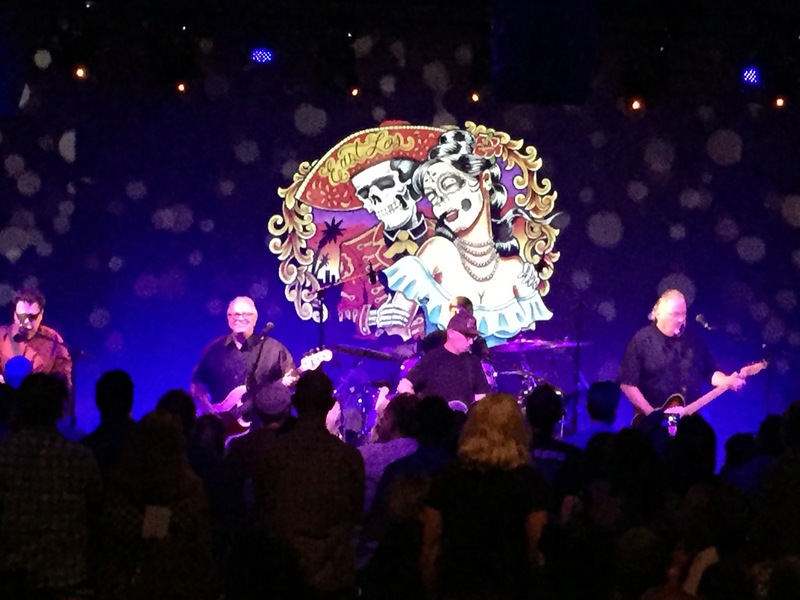 “Summertime and the living is easy” sums up my sunny season. Not to age me however saying I think of these lyrics done by Ella-not Sublime does so. 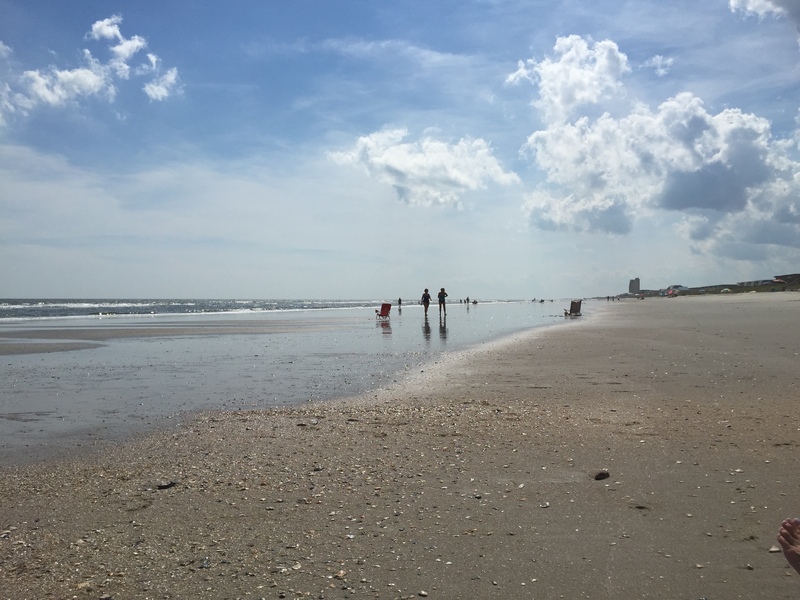 My leisurely summer has been way different than past summers and included some firsts-like doing consulting work and acquiring a beach condo. Fall moves into view with gardens looking dried out and weary, leaves starting to fall, and produce piling up on countertops. The produce has provided lots of good eating and putting food up, I will make another batch of salsa and some hot pepper jam. The fall garden got off to a rocky start, the pests almost wiped out the napa cabbage and broccoli, The snap peas are coming up, and the lettuce is trying to through the last of the summer heat. 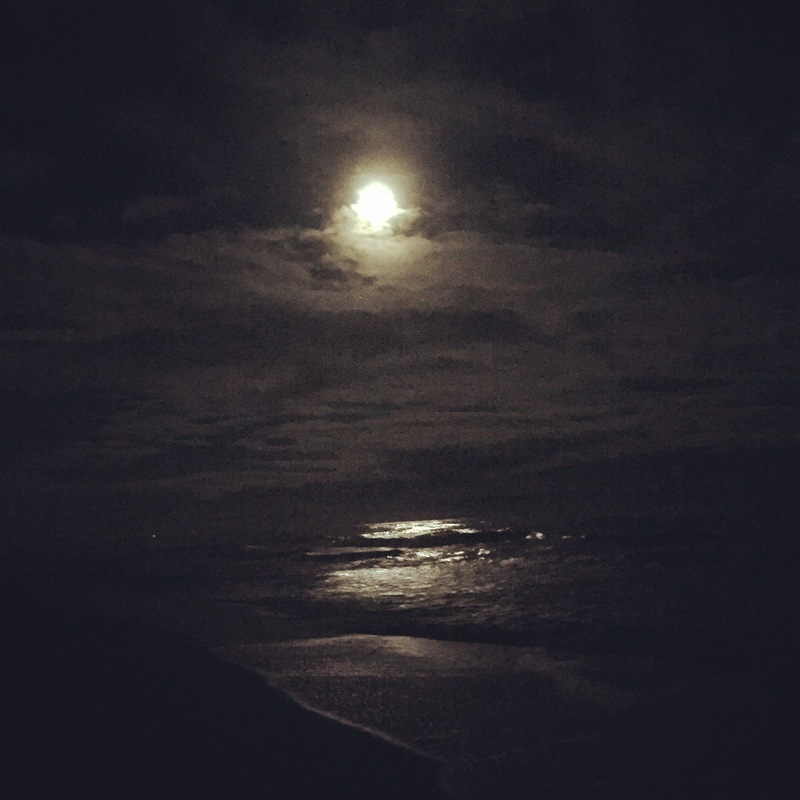 Caught August’s full moon while at the beach on a late night stroll. It was a very windy night, the surf was up with the tide. The next day proved absolutely gorgeous, low humidity, and later in the day during low tide, I took the following photo after I awoke from a long nap. I have started the canning and preserving mode. Even though the first part of the summer with all the rain about did in the garden between weeds and fungi of one kind or another, I have managed to limp through it and now the plants look like they will continue bearing for awhile. 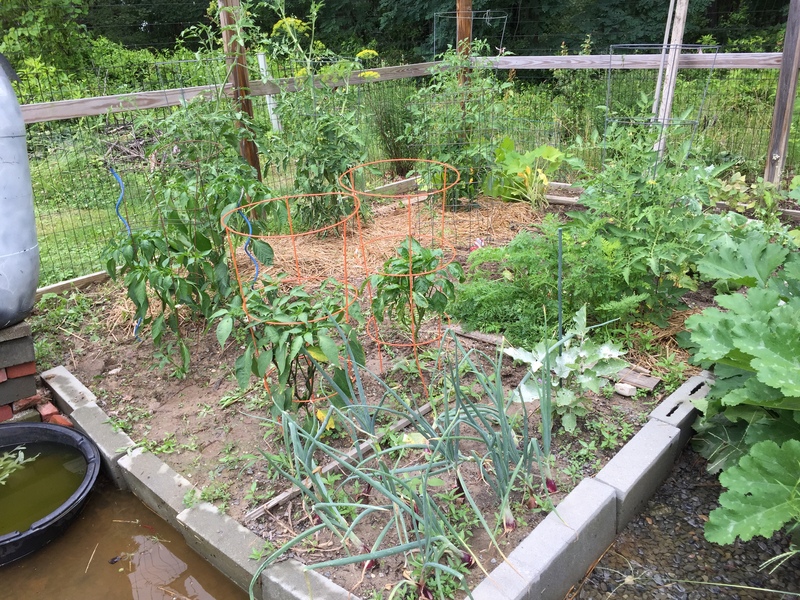 The tomatoes are doing better, the cucumbers have been slow but now are going full on, the peppers and tomatillos are producing non-stop and the eggplants have finally kicked in. The squash rotted away and I didn’t replant timely. In betwee n trips, I made tomatillo sauce and marinara sauce though both were small batches, about 5 1/2 quarts of marinara and 4 quarts of tomatillo sauce. 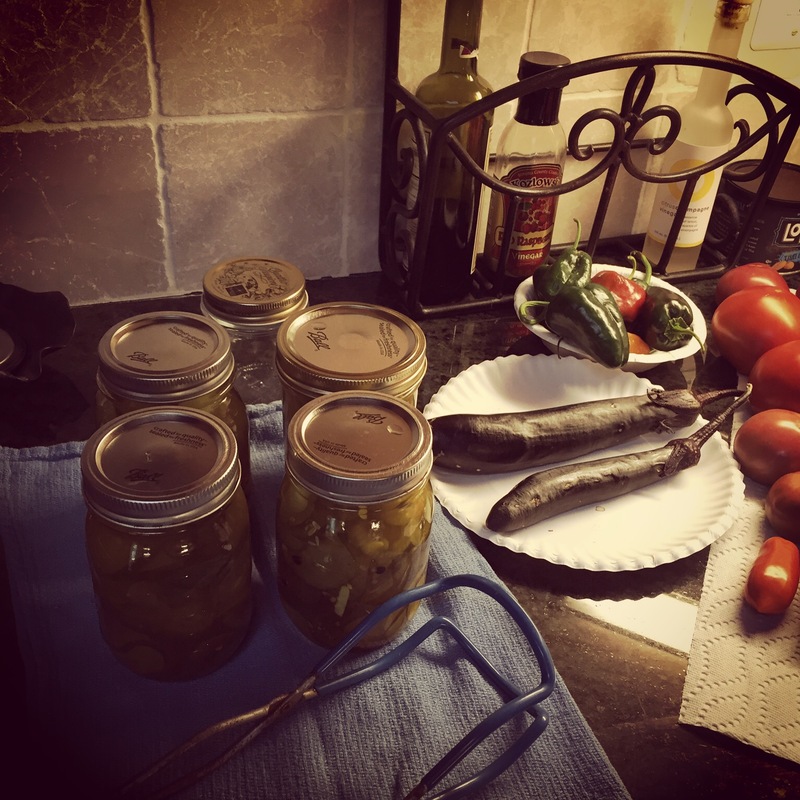 This last weekend, I made bread and butter pickles, using a new-to-me recipe found here Chef John’s breadnbutter pickles. This recipe adds jalapeño peppers, some clove and whole peppercorns. I really like the taste, a bit more layered and not as sweet, of course being the only consumer of pickles in the house-I have no one to help with the comparison! I am freezing tomatoes as I pick them and hope to have enough to make more marinara. I think I will have to buy some romas to augment my supply in order to make salsa. I have lots of poblano, habanero, green bell, jalapeño, and hot peppers. I will make stuffed peppers and freeze them today. In the next few days will make the first batch of hot pepper jam. The kitchen counter is crowded! I am starting to plant the fall garden, ordered a hard neck garlic variety and more sweet onion sets. I will plant some green beans, mesclun, kale, radishes, beets and turnips. Also picked up some napa cabbage and broccoli starts at the local big box store, on an impulse, so will find a spot for these too! And have been planning some clean up work at the community garden so need to start recruiting assistance! Looking forward to a bountiful fall. We have had just an enormous amount of rain the last few weeks. The community garden has been flooded, leaves are yellowing, fungi raging through, and weeds taking over. From here on out, in terest may wane as the initial blooms of excitement fade what with weeding, 90 degree days, and bugs-lots of mosquitos. We had about 5-6 inches of water in the gravel walkways which means the rainwater cache system underneath was completely full. Had to pump the water out across the field and to the street several times as we keep having torrential downpours. The silver lining is we don’t have to water! And while all of the hard work can be a bit much, the harvesting helps, tomatoes are ripening, along with peppers, cukes, squash, onions. The fence at the community garden keeps all the critters out except for little chipmunks and squirrels. At home, all my tomatoes were stolen, the numerous San Marzanos, and the Georgia streaks! I suspect a ground hog or raccoon. With the neighbor and her dog gone for the summer, the critters have free rein. I will have to put up a fence now to keep them out. 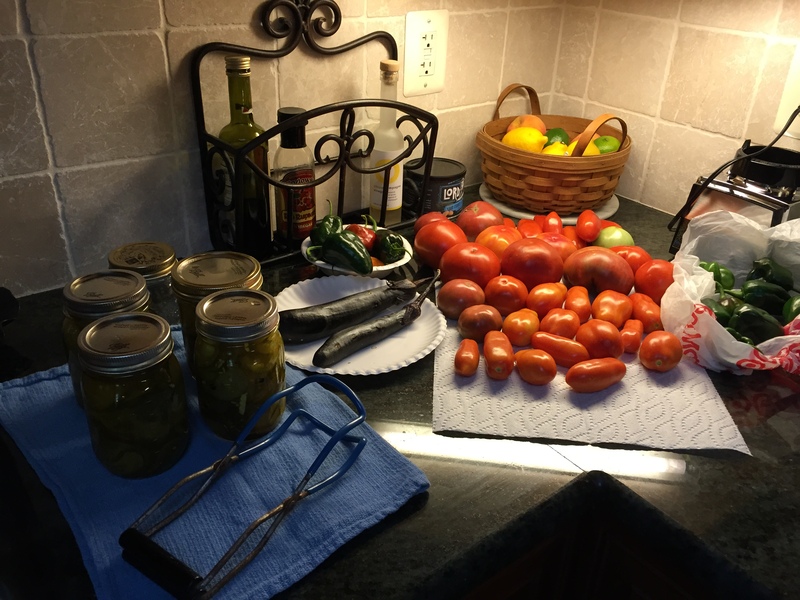 We enjoy the Cherokee purples and mortgage lifters, making Caprese salads, BLTs, sliced tomatoes on sausage biscuits, hopefully I will start canning tomatoes very soon.